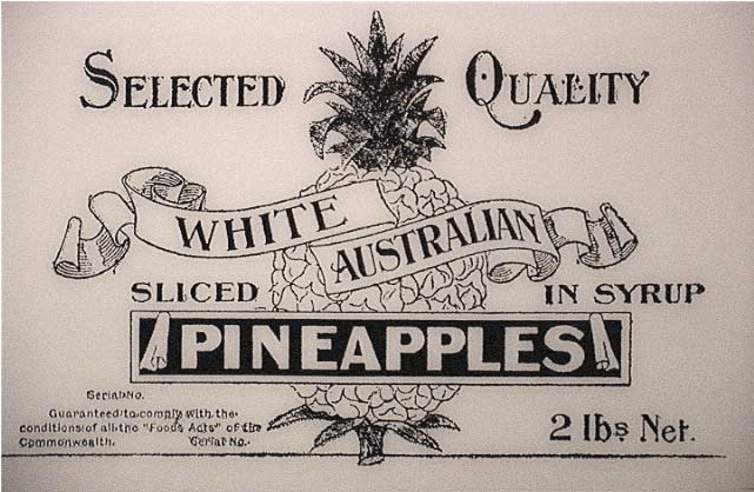 The ‘White Australia’ ideology was commercialised and used to sell things from soaps and games to pineapple slices. Multicultural Research Library. The Conversation is running a series of explainers on key moments in Australian political history, looking at what happened, its impact then, and its relevance to politics today. Prime Minister Malcolm Turnbull has repeatedly claimed that Australia is the world’s most successful multicultural nation. While the sentiment has bipartisan support today, for more than half a century after Federation Australia boasted not of multiculturalism, but of its monoculture. In 1925, Prime Minister Stanley Bruce reassured a worried public that Australia’s racial makeup was 98% British and that this was unlikely to change. The means of maintaining this racial and cultural homogeneity is loosely termed the White Australia policy. There is no racial equality. There is that basic inequality. These races are, in comparison with white races – I think no-one wants convincing of this fact – unequal and inferior. The White Australia policy was in place for seven decades after 1901 and had a profound impact on the newly federated Commonwealth. The White Australia policy was not a single government directive but a series of acts with a common goal: to achieve and maintain a white, British national character. The Immigration Restriction Act, Pacific Island Labourers Act and the Post and Telegraph Act (all passed in 1901) formed the initial legislative foundation. The Immigration Restriction Act in particular epitomises the spirit of the White Australia policy, and its hypocrisy. It never mentioned the words “white” or “race”, but the parliamentary debates – and its application – make clear it was a tool of racial exclusion. The act’s most infamous feature was a dictation test. Migrants could be asked to write 50 words in any European language. Officers could manipulate the test to exclude any undesired person. The most famous example was Jewish communist Egon Kisch. Fluent in several European languages, he was arrested after failing to recite the Lord’s Prayer in Scottish Gaelic. Between 1901 and 1958 (when it was dumped), only around 2,000 people ever took the test. Despite the non-racial terminology, its purpose was understood. As a direct result, non-whites largely avoided coming to Australia, and overseas shipping companies did not issue tickets to people likely to fail the test. The White Australia policy received bipartisan support, but was gradually dismantled by both sides. Conservative governments introduced the Migration Act in 1958 and its significant modification in 1966. Driven partly by the “populate or perish” doctrine, non-Europeans were allowed to come to Australia based on skills and suitability rather than race. Eventually they were offered the same pathway to citizenship as Europeans. The progressive Whitlam government symbolically buried the last remnants of the White Australia policy in 1973. The Racial Discrimination Act made it illegal to “offend, insult, humiliate or intimidate” someone because of their race. Those words are from Section 18C of that act, which the current government is seeking to amend. The legal mechanisms of the White Australia policy were tied to a widespread belief in the superiority of British civilisation and the white race generally during this era. Australia for the White Man. … get the coloured men out and the white men in. There were White Australia theatre productions, songs, pins and badges, soaps, and even a White Australia brand of sliced pineapple in syrup. It was as much a cultural as political phenomenon, and it could not be simply extinguished with an act of parliament. The acceptance of large numbers of Vietnamese refugees under the Fraser government was seen as a litmus test of whether the White Australia policy was really gone. 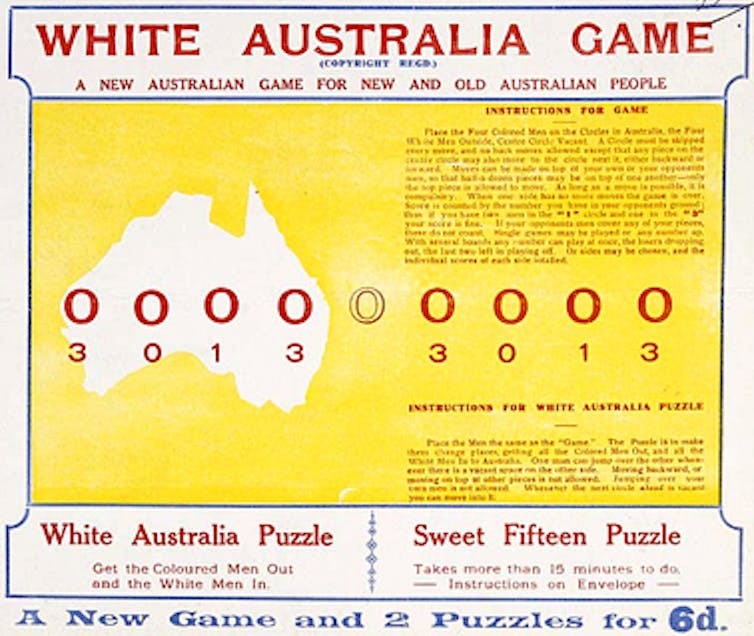 The White Australia Game was registered in 1914 and was popular throughout the 1920s. Migration Heritage Centre. What are its contemporary implications? Both major parties have endorsed multiculturalism for nearly half a century. Even in this era of Trumpian populist politics, it is inconceivable that Australia would ever return to race-based immigration policies. But if the White Australia policy is dead, has the White Australia ideology survived? In the 1980s, the Garnaut report made the economic case for greater Asia literacy. However, the region was – and still is – viewed by many with suspicion. In 1996, Pauline Hanson warned parliament that Australia risked being “swamped by Asians”. In the lead-up to the 2001 election, Norwegian container ship the MV Tampa rescued 438 asylum seekers and attempted to enter Australian waters. Prime Minister John Howard refused to accept them, causing a tense diplomatic stand-off. The widespread support for Howard, which arguably helped him secure election victory, has been seen by some as evidence of a lingering White Australia mindset. Academics James Jupp and Gwenda Tavan have argued that the White Australia ideology is still shaping Australian immigration policies in the 21st century, especially in regard to refugees. The bipartisan commitment to offshore processing and the re-emergence of Hanson’s One Nation party following the 2016 election lend some weight to this view. The dictation test was undoubtedly political spin to justify a racist agenda. A century later, similar charges have been levelled at the “stopping deaths at sea” defence, which is used to justify the current “harsh” treatment of predominantly non-white asylum seekers. As a policy, White Australia is gone. But as an ideology, it arguably lingers on. There certainly is a minority who want to “reclaim” an imagined idyllic Australia of yesteryear, with its white monoculture. An overwhelming majority, however, agree with the prime minister. Multiculturalism is here to stay. Benjamin T. Jones is an Australian Research Council Fellow in the School of History at the Australian National University. This article was originally published on The Conversation. Read the original article.